Five years ago today, darkness covered our nation like never before when a crazed man ran through an elementary school in Newton, Connecticut, and executed 28 people, including 20 young children. To paraphrase St. John of the Cross, whose feast day we celebrate today, we began a dark night of the soul—and heart. Our hearts still ache at the loss of life from the evil of gun violence as the Las Vegas shooting lingers in our memories. Just last Thursday, a 21-year-old man entered a New Mexico high school and killed two students. I rejoice heartily in the LORD, in my God is the joy of my soul; for he has clothed me with a robe of salvation and wrapped me in a mantle of justice, like a bridegroom adorned with a diadem, like a bride bedecked with her jewels. What grace to be able to rejoice heartily in the Lord, who is the joy of our soul! What power and protection to be wrapped in clothes of salvation and justice; who could possibly be harmed with such a spiritual bullet-proof vest? Yet, another question emerges: What is our role in all of this? At the source of this pandemic of gun violence must be massive doses of anger or some sort of pathology that is not so easily discernible. Insofar as anger is at work, how do we as disciples tame our own anger at home, work, school, or the community in which we live? 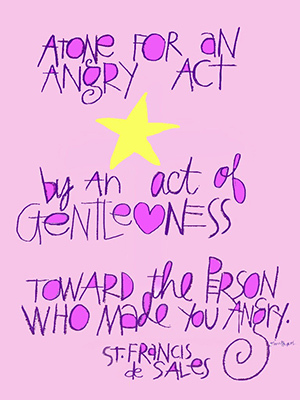 St. Francis de Sales exhorts us here: “Atone for an angry act by an act of gentleness toward the person who made you angry.” Of course, we would never resort to level of violent rage that poisons our world, yet can we afford even the small drops of poison that could seep from our angry hearts? Gentle atonement is a ready, Salesian antidote to counter this societal infection with amazing grace.